Background Ventilator-acquired pneumonia (VAP) remains a significant problem within intensive care units (ICUs). There is a growing recognition of the impact of critical-illness-induced immunoparesis on the pathogenesis of VAP, but the mechanisms remain incompletely understood. We hypothesised that, because of limitations in their routine detection, Mycoplasmataceae are more prevalent among patients with VAP than previously recognised, and that these organisms potentially impair immune cell function. Methods and setting 159 patients were recruited from 12 UK ICUs. All patients had suspected VAP and underwent bronchoscopy and bronchoalveolar lavage (BAL). VAP was defined as growth of organisms at >104 colony forming units per ml of BAL fluid on conventional culture. Samples were tested for Mycoplasmataceae (Mycoplasma and Ureaplasma spp.) by PCR, and positive samples underwent sequencing for speciation. 36 healthy donors underwent BAL for comparison. Additionally, healthy donor monocytes and macrophages were exposed to Mycoplasma salivarium and their ability to respond to lipopolysaccharide and undertake phagocytosis was assessed. Results Mycoplasmataceae were found in 49% (95% CI 33% to 65%) of patients with VAP, compared with 14% (95% CI 9% to 25%) of patients without VAP. Patients with sterile BAL fluid had a similar prevalence to healthy donor BAL fluid (10% (95% CI 4% to 20%) vs 8% (95% CI 2% to 22%)). The most common organism identified was M. salivarium. Blood monocytes from healthy volunteers incubated with M. salivarium displayed an impaired TNF-α response to lipopolysaccharide (p=0.0003), as did monocyte-derived macrophages (MDMs) (p=0.024). MDM exposed to M. salivarium demonstrated impaired phagocytosis (p=0.005). Discussion and conclusions This study demonstrates a high prevalence of Mycoplasmataceae among patients with VAP, with a markedly lower prevalence among patients with suspected VAP in whom subsequent cultures refuted the diagnosis. The most common organism found, M. salivarium, is able to alter the functions of key immune cells. Mycoplasmataceae may contribute to VAP pathogenesis. What is the prevalence of Mycoplasmataceae among patients with ventilator-acquired pneumonia (VAP), and does this have any pathophysiological relevance? Patients with VAP have a high prevalence of Mycoplasmataceae compared with similar patients without VAP, and the most common species found can impair immune cell function. These findings provide a novel insight into the biology of VAP and suggest new potential prevention strategies. The organisms which cause VAP have traditionally been thought to be conventional bacterial species, such as Staphylococcus aureus and Pseudomonas aeruginosa.5 However our understanding of the microbiology of VAP is heavily influenced by the relative ease of microbial culture. In recent years there has been a greater understanding of the human microbiome and the influence of bacteria that are not cultured.6 Recent reports have suggested that non-classical organisms, such as Mycoplasma spp., may be present in patients with VAP.7 ,8 The methods of detection used in these studies have been variable and there was little evidence of the impact these species may have on host immunity. We hypothesised that patients with confirmed VAP would have a higher prevalence of Mycoplasmataceae than patients without VAP, and that the dominant organism found (M. salivarium) would impair the ability of monocytes and macrophages to respond to further bacterial stimuli. Accordingly, this study had two aims; first, to quantify the prevalence of Mycoplasmataceae in two cohorts of patients with suspected VAP and determine which species were present. The second aim was to examine the effect of a classically non-pathogenic Mycoplasma, M. salivarium, on the ability of monocytes and macrophages to respond to pathogenic stimuli. We constructed the subject cohorts for this study from clinical samples and data from two recent patient studies and a healthy volunteer cohort.13 ,14 The first patient cohort was recruited from two general, teaching hospital ICUs from 2005 to 2009. Patients were included if they fulfilled clinical criteria for suspected VAP, that is, mechanical ventilation for >48 h, new infiltrates on chest radiograph, and at least two of the following: temperature >38°C, leucocyte count >11×109 per litre of peripheral blood or purulent tracheal secretions. The second patient cohort was recruited from 12 ICUs across the UK from 2012 to 2013, and met similar enrolment criteria to those in patient cohort 1. Both cohorts 1 and 2 underwent a standardised bronchoscopy and bronchoalveolar lavage (BAL) as described.13 ,14 In both cohorts VAP was confirmed by growth of organisms at >104 colony forming units per ml of BAL fluid (CFU/mL) on conventional culture. The healthy volunteers were recruited from the University of Edinburgh and from a primary care practice. Volunteers underwent either bronchoscopy and BAL using the same protocol as used in patient cohort 1, or phlebotomy for extraction of peripheral blood leucocytes for the leucocyte function experiments detailed below. BAL fluid was prepared as described,13 with the cell-free supernatant being stored at −80°C. Aliquots of BAL fluid from patient cohort 1 and healthy volunteers underwent nucleic acid extraction by one of the authors (NJG) using the DNeasy Blood and Tissue kit (Qiagen, Manchester, UK) with pretreatment protocol for Gram-positive bacteria, according to the manufacturer's instructions. Extractions for patient cohort 2 were undertaken by another author (JPM) using the MagNA pure 96 DNA and viral NA small volume kit (Roche, Indianapolis, Indiana, USA) in a geographically separate laboratory. The extraction in two laboratories was undertaken to confirm that the Mycoplasma detection was not occurring due to contamination of consumables in one or other laboratory. Further confirmation came by running the PCR on saline passed through the same extraction columns but without contact with the patient or volunteer BAL fluid samples. PCR for Mycoplasma spp. was based on the method of van Kuppeveld et al15 targeting the 16S rRNA gene using forward primer general prokaryotic oligonucleotides-1 (GPO-1) and reverse primer mycoplasma genus-specific oligonucleotides (MGSO) and gel electrophoresis for detection. Positive extracts were sequenced on the reverse strand to determine Mycoplasma spp. using the QIAquick PCR purification kit (Qiagen) for purification, and ABI Prism BigDye Terminator and the ABI 3730 instrument (Applied Biosystems, Life Technologies, Paisley, UK) for Sanger sequencing. Ureaplasma spp. real-time PCR was based on an inhouse unpublished method targeting the urease gene using the following oligonucleotides; UreF: ACG WCG TTT CGA TAT TCC AT, UreR: TTC CRT TAA CTA AGC CRT TT and UreP: 6′FAM—TCG TTT TGA ACC AGG AGA YAA AA—BHQ1. Reactions comprised HotStarTaq (Qiagen) reagents, 0.5 μM primer Ure-F, 0.65 μM primer UreR, 0.2 μM probe UreP and 10 μL nucleic acid extract to a final volume of 25 μL. Real-time PCR was carried out on the ABI 7500 instrument (Applied Biosystems). Ureaplasma spp. positive extracts were speciated using the method of Kong et al16 targeting the 5′ end of the MBA gene with primers UMS-57c and UMA222 for U. parvum and UMS-170c and UMA263 for U. urealyticum, followed by gel-based detection. Human mononuclear cells were obtained from whole blood from healthy donors using previously described methods.17 ,18 Briefly, leucocytes were obtained by dextran sedimentation, with separation of mononuclear and granulocytic cells over Percoll gradients. CD14+ve monocytes were extracted from the mononuclear fraction using a magnetic bead system (MACS, Miltenyi Biotec, Bisley, UK), and >95% purity confirmed by flow cytometry. Monocytes were either used fresh at 300 000 per well, or matured into monocyte-derived macrophages (MDMs). MDMs were produced by adhering 300 000 monocytes to 24-well tissue culture plates (Corning Costar, Sigma-Aldrich, Gillingham, UK) and incubating in Iscove's modified Dulbecco's medium and 10% autologous serum for 7 days. MDM maturation was confirmed morphologically using light microscopy. Monocytes and MDMs were initially exposed to three titres of live M. salivarium strain NC10113 (Mycoplasma Experience, Bletchingley, UK), namely multiplicity of infection (MOI) of 1:10 (low), 1:1 (moderate) and 10:1 (high) for 24 h at 37°C and 5% CO2. Cell death was assessed by nuclear staining using Sytox Green (Life Technologies) and fluorescence microscopy, counting the number of fluorescent cells in three randomly selected fields per well, with a minimum of 100 cells per field. All experiments were conducted in duplicate using a minimum of n=3 individual donors. Monocytes and MDMs were cultured as above and exposed to either live M. salivarium or vehicle control for 24 h. Supernatants were removed, centrifuged at 200 g for 10 min and frozen for later analysis. In subsequent experiments monocytes and MDMs were cultured with M. salivarium or vehicle control for 24 h and then, without washing or changing supernatant, exposed to lipopolysaccharide (Escherichia coli 0127:B8, Sigma-Aldrich, Gillingham, UK) at 100 ng/mL for a further 24 h, before supernatants were removed and processed as above. Cytokines were assayed using Cytometric Bead Array (BD Biosciences, Oxford, UK). MDMs were exposed to live M. salivarium or vehicle control for either short (60 min) or long (24 h) incubations. Following this the cells were presented with a phagocytic target, pHrodo Red Zymosan (Life Technologies) that had been opsonised in autologous donor serum. Cells were exposed to 0.02 mg/mL zymosan for 30 min before being placed on ice and phagocytosis assessed by fluorescence microscopy. Categorical variables were expressed as proportions and compared using Fisher's exact test. Continuous variables were expressed as mean values and compared using one-way analysis of variance (ANOVA) with Bonferroni's post hoc test for comparison between individual conditions. All analyses were performed using Prism (Graphpad Software, La Jolla, California, USA). p≤0.05 was considered statistically significant. The samples from patient cohorts 1 and 2 were collected in studies approved by the Lothian Research Ethics Committee (REC) (LREC/2002/8/19) and NRES North East REC (11/NE/0242) and Scotland A REC (11/SS/0089), respectively, with the informed consent/assent from the next of kin. The healthy volunteer BAL fluid was obtained from volunteers in a study approved by Lothian REC (06/S1101/50) with all volunteers giving written informed consent. The monocyte and MDM experiments were conducted using cells obtained under the authorisation of the Lothian REC (08/S1103/38) following written, informed consent. Detection of Mycoplasma and Ureaplasma spp. Detection of Mycoplasmataceae (Mycoplasma and Ureaplasma spp.) occurred significantly more frequently in patients with VAP compared with those without VAP (table 1). This was the case for both patient cohorts. Among patients without VAP, the frequency of Mycoplasmataceae was higher in those who had some growth on culture as opposed to those whose BAL fluid was sterile by conventional culture, although none of these differences reached statistical significance (table 1). 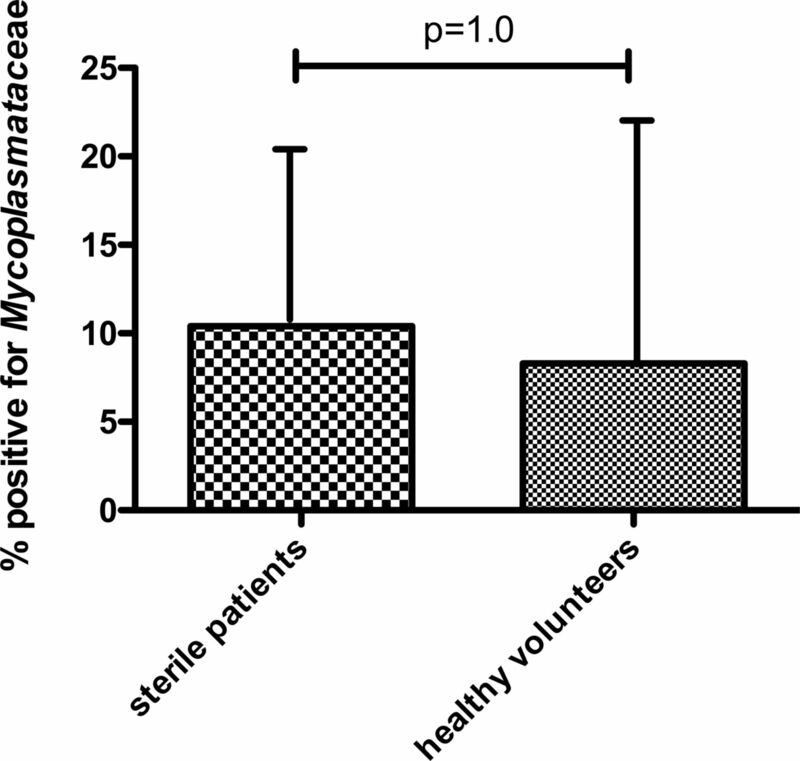 The frequency of Mycoplasmataceae detection did not differ significantly between patients with sterile cultures and healthy volunteers (p=1.0 by Fisher's exact test, figure 1), nor was the trend in difference between all non-VAP patients and healthy volunteers significant (14% (95% CI 9% to 25%) vs 8% (95% CI 2% to 22%), p=0.57 by Fisher's exact test). Proportion of healthy volunteers and patients with no microbial growth (by conventional culture) in whom Mycoplasmataceae were detected. Data shown as proportion and upper 95% CI. p Value by Fisher's exact test. The majority (82%) of Mycoplasmataceae detected in patients were Mycoplasma spp., and within this group M. salivarium was the dominant organism detected (table 2). Two healthy volunteers were positive for Mycoplasma spp. by PCR but sequencing revealed non-Mycoplasmataceae organisms (Solobacterium moorei) and these samples were excluded from the ‘positive’ samples. Among the remaining three healthy volunteer samples that were positive for Mycoplasma spp. sequencing revealed one M. salivarium and two mixed species. The presence of atypical organisms did not differ significantly between patients with VAP arising from differing aetiological classes (table 3). Following the discovery of a high prevalence of M. salivarium among patients with VAP (52% of Mycoplasmataceae in patients with VAP were M. salivarium), we hypothesised that this species may have a role to play in the pathogenesis of VAP. We therefore examined the effect of M. salivarium infection on the ability of key immune cells, monocytes and macrophages, to respond to bacterial stimuli. Neither monocytes nor MDMs exposed to live M. salivarium for 24 h at MOIs of 1:10 (low) and 1:1 (moderate) exhibited significantly greater cell death than untreated cells (figure 2A, B). A high MOI (10:1) induced 30% cell death in MDMs (figure 2B, far right column). Monocytes appeared relatively resistant to such effects (figure 2A), although demonstrated an overall higher basal level of cellular death than MDMs. Subsequent experiments were confined to low and moderate exposures for both cell types. Cell death associated with Mycoplasma salivarium in monocytes and monocyte-derived macrophages (MDMs). (A). Numbers of Sytox green positive monocytes as a proportion of total cells from three randomly selected fields per condition, n=3 individual donors. p=0.56 by ANOVA. Data shown as mean and SD. (B). Numbers of Sytox green positive MDMs as a proportion of total cells from three randomly selected fields per condition, n=3 individual donors. p<0.0001 by ANOVA, ****p<0.0001 by Bonferroni's post hoc test, all other comparisons non-significant by Bonferroni's test. Data shown as mean and SD. As expected, lipopolysaccharide (LPS) alone significantly increased the secretion of tumour necrosis factor (TNF)-α, interleukin (IL) 6 and IL-10 from monocytes and MDM (figure 3); in general M. salivarium alone had a similar but smaller effect (see online supplementary tables S3 and S4). 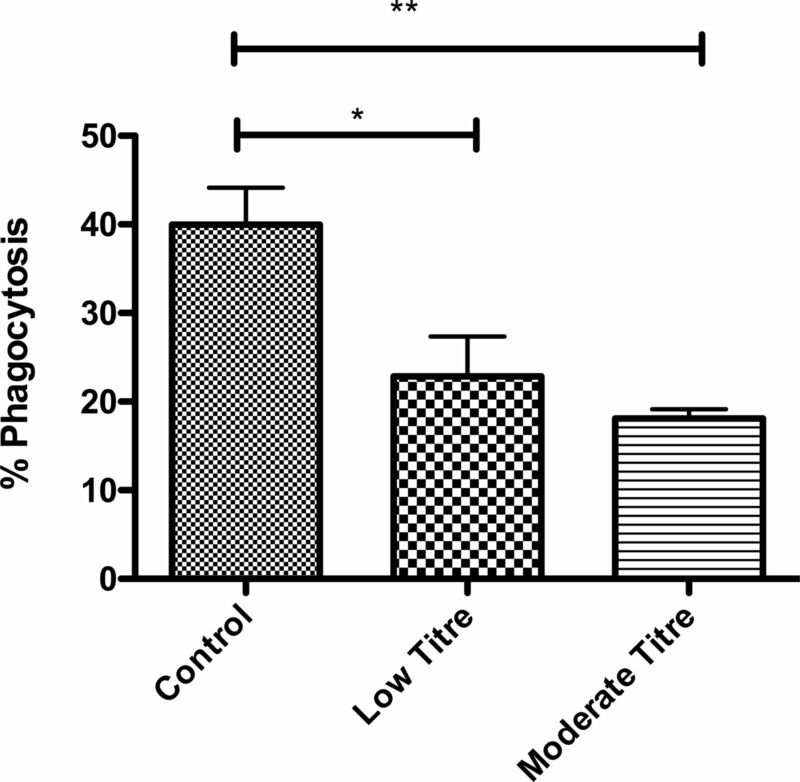 However, the TNF-α response to an LPS challenge was impaired following both low and moderate M. salivarium exposure in monocytes and macrophages (p=0.0003 and p=0.0024 by ANOVA, respectively) (figure 3A, B). A similar although slightly less pronounced pattern was seen with IL-6 (p=0.0006 and p=0.04) and IL-10 (p=0.02 and p=0.004) secretion (figure 3C–F). IL-8 secretion showed a contrasting pattern, being unchanged in monocytes (p=0.55) while macrophages showed enhanced IL-8 secretion with Mycoplasma exposure (p=0.0013) (figure 3G, H). Effect of exposing monocytes and monocyte-derived macrophages (MDMs) to Mycoplasma salivarium and lipopolysaccharide (LPS), on cytokine secretion. (A) TNF-α secretion by monocytes, p=0.0003 by ANOVA. (B) TNF-α secretion by MDMs, p=0.0024 by ANOVA. (C) Interleukin (IL) 6 secretion by monocytes, p=0.0006 by ANOVA. (D) IL-6 secretion by MDMs, p=0.04 by ANOVA. (E) IL-10 secretion by monocytes, p=0.02 by ANOVA. (F) IL-10 secretion by MDMs, p=0.004 by ANOVA. (G) IL-8 secretion by monocytes, p=0.55 by ANOVA. (H) IL-8 secretion by MDMs, p=0.0013 by ANOVA. *p<0.05, **p<0.01, ***p<0.001 by Bonferroni's post-hoc test, all other comparisons were non-significant by Bonferroni's test. Results are from duplicates of n=3 individual healthy donors, with 300 000 cells per well. Data shown as mean and SD. MOI, multiplicity of infection. Phagocytosis of microbes and other particulate matter by macrophages is a key part of pulmonary defences, as it directs destruction of the microorganism and facilitates antigen presentation to effector cells19 M. salivarium significantly impaired phagocytosis by macrophages following 24 h exposure (figure 4), with moderate titre having a more pronounced effect than low titre (p=0.005 by ANOVA). Phagocytosis of zymosan by monocyte-derived macrophages (MDMs) exposed to Mycoplasma salivarium. 24 h exposure at multiplicity of infection (MOI) of 1:10 (low) and 1:1 (moderate) titre. p=0.005 by ANOVA. Data shown as mean and SD. *p<0.05, **p<0.01 by Bonferroni's post-hoc test, all other comparisons non-significant. Results are from duplicates of n=4 individual healthy donors, with 300 000 cells per well, data shown as mean and 95% CI. This study is, to our knowledge, the most comprehensive description of Mycoplasmataceae in VAP to date. Through the use of molecular diagnostics we have confirmed previous findings of Mycoplasma presence7 ,8 in a more robust manner and, importantly, identified the species involved. We have also demonstrated the presence of small numbers of Ureaplasma spp., organisms more commonly found in genitourinary tract infections. The striking difference in prevalence between patients with and without microbiologically confirmed VAP invites several possible explanations. First, the presence of Mycoplasma spp. in BAL may simply reflect the burden of microaspiration from the oropharynx. Second, the presence of Mycoplasma in BAL fluid may be indicative of a relative immune failure2 which leaves patients unable to clear these low pathogenicity organisms, with the immune failure being more pronounced in those who develop VAP. A third possibility is that Mycoplasma may contribute to the pathogenesis of VAP by directly impairing immune function, thus facilitating infection by other ‘classical’ VAP pathogens. We believe this study has a number of strengths. First we examined a large number of samples taken from the alveolar region of the lungs of patients with suspected VAP and these samples came from a range of locations throughout the UK. It is therefore unlikely that these findings are specific to a single unit or geographical region. Second, by using the latest molecular techniques we were able (A) to identify Mycoplasma with greater confidence than previous studies which relied on Mycoplasma toxin detection7 or limited PCR,8 and (B) to identify the specific species involved. Third, by undertaking examination of the effects of the most common identified species, M. salivarium, on two key innate immune cells, we were able to strengthen our hypothesis that this organism is not simply a bystander but is contributing to the immunoparesis that facilitates VAP. Our study is limited by having a sample from a single time point, at the time of suspected infection. Therefore we cannot comment on when the Mycoplasmataceae appeared in the alveolar space relative to the development of VAP. As such we are certainly unable to infer a causative relationship between Mycoplasmataceae and subsequent VAP. Our positive event rate of 21 patients with Mycoplasmataceae and VAP prevents more in-depth examination of the relationship between Mycoplasmataceae, clinical features and outcomes from VAP. We were also unable to precisely quantify the amounts of non-classical organisms present in the lungs of patients, although the ability to obtain good speciation data for the great majority of the Mycoplasma positive samples from patients with VAP suggests a reasonable bacterial load. The titres of M. salivarium to which the monocytic cells were exposed therefore remain an approximation of the situation in vivo. Indeed our in vitro model of Mycoplasma infection is necessarily a simplification of the in vivo situation. The implications of this work are that preventing lower respiratory tract Mycoplasma spp. infection, through improved oral hygiene measures and prevention of microaspiration, may contribute to preventing VAP through immune restoration. This hypothesis could also provide a novel explanation for the finding that incorporating macrolides to antibiotics for VAP improves outcomes,27 beyond the more widely accepted immunomodulatory effects of macrolides.28 We do not, however, advocate broadening antibiotic coverage on the basis of our findings, as only further clinical trials could justify such an approach. The high prevalence of Mycoplasmataceae among patients with VAP should also be considered when pan-bacterial molecular diagnostics, such as 16S rRNA gene PCR, are being used for pathogen detection in VAP; mixed sequences are difficult to resolve using conventional Sanger-based sequencing and may require next-generation sequencing methodologies. In conclusion we have found a high prevalence of non-classical bacterial species among patients with VAP, specifically organisms such as M. salivarium that are traditionally thought to be non-pathogenic. We have further demonstrated that these organisms can alter antibacterial functions in healthy volunteer monocytes and MDMs, and may have the potential to contribute to the immunoparesis seen in critically ill patients. The authors thank the VAP-RAPID collaborators, Daniel F McAuley, Niall H Anderson, Suveer Singh, Paul Dark, Alistair I Roy, Simon V Baudouin, Stephen E Wright, Gavin D Perkins, Melinda Jeffels, Cecilia M O'Kane, Craig Spencer, Shondipon Laha, Nicole Robin, Savita Gossain, Kate Gould, Marie-Hélène Ruchaud-Sparagano, Jonathan Scott, Ian Dimmick, Ian F Laurenson, Helen Walsh, Sarah Nutbrown, Charley Higham, Teresa Melody, Keith Couper, Jacqueline Baldwin, Alexandra Williams, Kylie Norrie, Julie Furneval, Tracey Evans, Heidi Dawson, Griania White, Lia McNamee, Leona Bannon, Laura Evans, Neil Young, Alasdair Hay, Ross Paterson, Stuart McLellan, Peter Kelleher, Berge Azadian, Masao Takata, Ildiko Kustos, John Cheesborough and Roland Koerne, for their work in recruiting the patients to cohort 2. The authors also thank David Swann, Pam Ramsay, Gordon McNeil and Kallirroi Kefala for their work in recruiting patients into cohort 1. The authors also thank the patients and their relatives who allowed this research to occur.
. Atypical bacteria in ventilator associated pneumonia; an Egyptian University Hospital experience. J Am Sci 2010;6:1074–9.
. Molecular biology and pathogenicity of mycoplasmas. Microbiol Mol Biol Rev 1998;62:1094–156.
. Enumeration, isolation, and species identification of mycoplasmas in saliva sampled from the normal and pathological human oral cavity and antibody response to an oral mycoplasma (Mycoplasma salivarium). J Clin Microbiol 1986;23:1034–8.
. Genus- and species-specific identification of mycoplasmas by 16S rRNA amplification. Appl Environ Microbiol 1992;58:2606–15.
. Species identification and subtyping of Ureaplasma parvum and Ureaplasma urealyticum using PCR-based assays. J Clin Microbiol 2000;38:1175–9.
. Modulation of multiple neutrophil functions by preparative methods or trace concentrations of bacterial lipopolysaccharide. Am J Pathol 1985;119:101–10.
. Effects of interactions between intestinal microbiota and intestinal macrophages on health. Anticancer Res 2013;33:2849–53. TJN and NJG contributed equally. ACM and AJS indicate joint senior authorship of this work. Contributors TJN conducted the research and drafted the paper, NJG conducted the research and drafted the paper, TPH recruited patients and obtained samples and revised the paper, KET obtained funding, supervised the research and drafted the paper, RM supervised the research and revised the paper, JPM conducted the research and revised the paper, JR conducted the research and revised the paper, CTR conducted the research and revised the paper, TSW obtained funding, devised the study and supervised the research and revised the paper, AGR supervised the research and revised the paper, ACM obtained funding, devised the study, supervised the research and drafted the paper, AJS obtained funding, obtained samples, devised the study and drafted the paper. Funding This study was funded by the Hospital Infection Society, Wellcome Trust/Department of Health Health Innovation Challenge Fund (HICF)(0510/078) and Sir Jules Thorn Charitable Trust (03/JTA). Competing interests RM is a Consultant/Advisor for Gilead Sciences Ltd and is the recipient of an Innovate UK grant with Randox Diagnostics to investigate diagnostic tests, KET is a consultant to Becton Dickinson, Cepheid, Enigma, GenMark and Selex. All other authors declare no conflicts of interest. Data sharing statement Additional unpublished data from this study can be obtained by direct contact with the corresponding author.